Amatrol’s Portable Pneumatic Troubleshooting Learning System (990-PTB1) teaches a variety of hands-on pneumatic troubleshooting skills that are vital for those who will perform industrial maintenance, installation, and troubleshooting on pneumatic systems used in real-world automation machinery, packaging equipment, pharmaceutical applications, and chemical handling tasks. The system features real-world components, such as valves, switches, and gauges — all within a convenient, durable, portable learning system. Some of the portable pneumatic troubleshooting training system’s industry-standard components include directional control valves, flow control valves, limit switches, and a programmable logic controller. The system also features FaultPro, Amatrol’s exclusive electronic fault insertion software. Using these real-world components, learners will study a wide variety of pneumatic troubleshooting topics, such as air preparation, pneumatic actuators and valves, vacuum systems, and pneumatic systems. The portable pneumatic troubleshooting training system features real-world components learners will encounter on the job, including directional control valves, double acting cylinders, flow control valves, vacuum and pressure gauges, and a S71200 Siemens PLC — all within a convenient, durable, portable learning system. Learners will learn hands-on skills, such as troubleshooting filters, cylinders, flow control valves, and quick exhaust valves via an in-circuit test. Learners will also practice troubleshooting low pressure, high pressure, actuators that move out of sequence, and actuator speed. Amatrol’s curriculum features a highly-interactive, multimedia format that includes stunning 3D graphics and videos, voiceovers of all text, and interactive quizzes and exercises designed to appeal to learners with different learning styles. The pneumatic troubleshooting curriculum teaches learners a variety of pneumatic troubleshooting topics, including symptoms of lubricator failure, the function of a rotary actuator, symptoms of vacuum switch failure, and how to troubleshoot zero pressure. 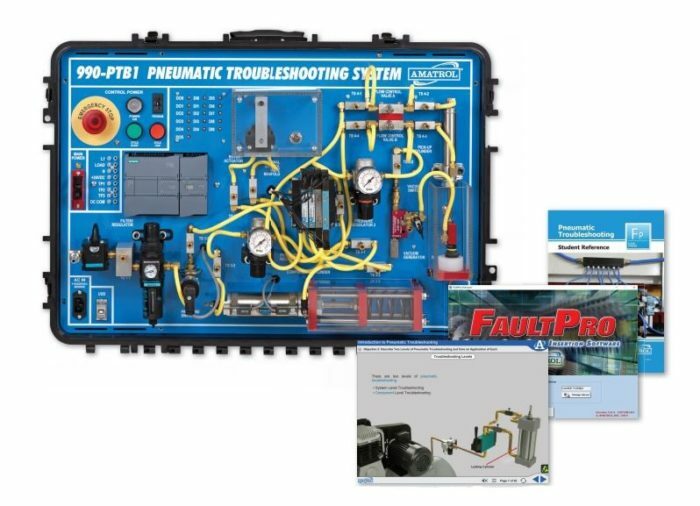 The portable pneumatic troubleshooting training system features FaultPro, Amatrol’s exclusive electronic fault insertion system. FaultPro allows users to insert more than 30 faults into the system for realistic troubleshooting of situations they will encounter on the job. FaultPro’s computer-based faults automatically track progress, enabling learners to gain troubleshooting skills in a self-paced environment that ensures that faults are inserted safely, protecting both learners and equipment. A sample copy of the Pneumatic Troubleshooting Student Reference Guide is also included with the system for your evaluation. Sourced from the system’s curriculum, the Student Reference Guide takes the entire series’ technical content contained in the learning objectives and combines them into one perfectly-bound book. Student Reference Guides supplement this course by providing a condensed, inexpensive reference tool that learners will find invaluable once they finish their training, making it the perfect course takeaway.